At the first presidential debate of 2016, the audience, containing members of the public, mostly honored moderator Lester Holt's instruction to remain silent throughout the course of the event. But there were inevitably moments of laughter and even cheering when a candidate issued a pithy one-liner, a soundbite, or an easy jab over a hot-button issue, including when it came to Hillary Clinton's email debacle and Donald Trump's refusal to release his tax returns until his audit is complete. I don't think debates should have public audiences because of the inevitability of these moments, which can impact two crucial elements: 1) the candidates' focus on policy, and 2) the perceptions of viewers at home. Let's face it, nobody's breaking the silence pact over the finer details of Trump's tax plan or Clinton's jobs proposal. 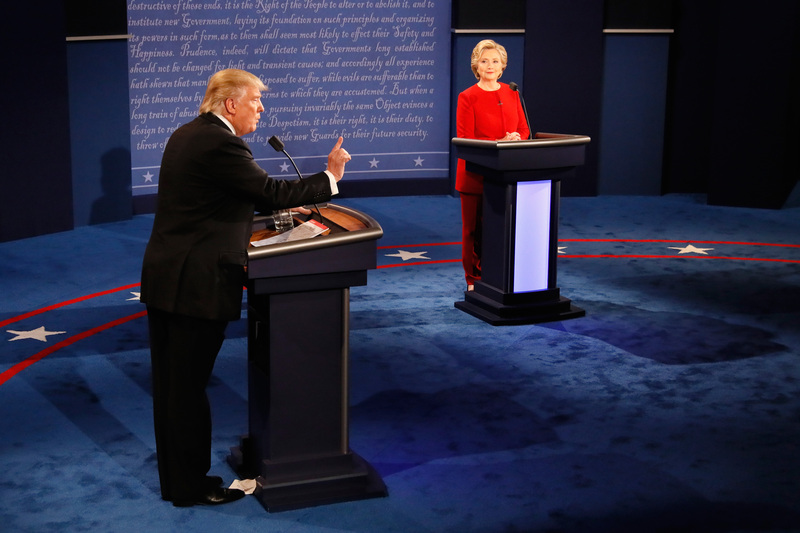 These policy-centric responses should reign supreme at presidential debates, during which many viewers may be learning about the candidates' proposals for the first time. But when a snarky comment elicits an audible response from the audience, it encourages the candidates to keep giving them what they appear to want — more personal attacks and insults, less dry (but all-important!) policy talk. And it turns out that giving the live audience what it wants is a politically strategic move by the candidates, since the live audience's audible reactions likely influence how the much larger audience watching from home judges their performances. The results illustrate the power of social context to strongly influence individuals’ judgments of even large amounts of relevant, important information, and they support the categorization of presidential debates as ambiguous stimuli, fertile ground for informational social influence. What all this means is that the presence of a live audience, with its inevitable reactions, is likely a powerful factor in driving down the quality of debates by discouraging substantive responses and favoring the barbs, the soundbites, and the one-liners which already comprise so much of the election coverage we have access to. And it likely distorts the perception of viewers at home by making it harder for them to draw reflective, independent conclusions regarding the candidates and their proposals. I want presidential candidates to give audiences what they don't seem to want: dry, unsexy, detailed policy proposals. They're more likely to do so without the temptation of an eruption of laughter or cheers, and viewers are more likely to come away with authentic judgments when debates are treated not as entertainment, but with the solemnity a political event merits.